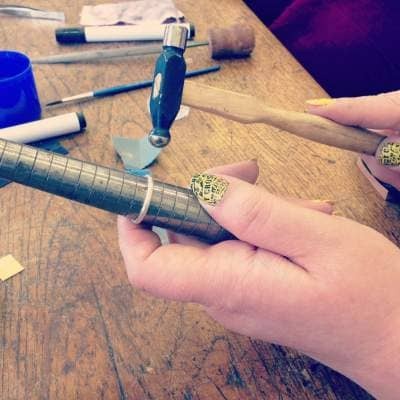 On Saturday 14 May 2016, Scarlett Erskine will hold two, two hour sessions at Dundee Science Centre, teaching visitors (age 12 and upwards) how to make their very own silver ring to take home. They will learn the basic skills of jewellery making from sawing, soldering and texturing metal to making their own ring. The workshops are part of the latest in a series of ‘Meet the Expert’ events at Dundee Science Centre, with Saturday’s ‘Innovate and Create’ seeing the Centre transformed into a creative hotbed from 11am until 3pm. ‘Make a Ring’ is aimed at people with no experience or knowledge of jewellery making, but who would love to make their own ring to add to their jewellery collection. Scarlett, who graduated from Jewellery and Metal Work, Duncan of Jordanstone College of Art and Design in 2012, launched Scarlett Erskine Jewellery in 2013. Working from the city’s Wasps Studios, she creates ranges of uniquely textured precious metal jewellery incorporating precious and semi-precious gemstones. She is currently working on a new wedding collection to launch later this year. 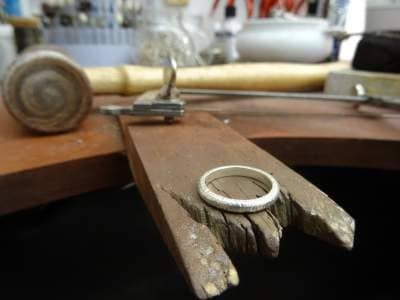 The ‘Make a Ring’ workshops will run from 11am-1pm and 2-4pm. Priced at £30, including tea, coffee and cupcakes during the workshops and admission to the whole of Dundee Science Centre. Places will be limited so advance booking and payment are essential (please telephone (01382) 228800 to ensure your place. Meanwhile, designer and maker Lizzie Armour will be demonstrating Dundee Science Centre’s 3D printer and inviting visitors to have a go at creating a 3D model using 3D modelling software between 11am and 3pm. This event will be included as part of normal admission. And last but certainly not least, Kerry Kidd from Raspi Kidd will be bringing along a couple of Raspberry Pi computers, giving children and adults alike the chance to get hands on with these amazing gadgets and figure out how to use them to build amazing creations in Minecraft as well as to control robots. ‘Meet the Expert’ events are planned for the second Saturday of each month throughout 2016 – please check the Dundee Science Centre website for upcoming events – www.dundeesciencecentre.org.uk. Dundee Science Centre is open daily from 10am-5pm. For further information, please telephone 01382 228800 or visit the website.